"I was already a pretty advanced guitar player when I met Jason. He was teaching this ensemble class where we wrote, arranged, and performed original music as a 6-piece band. At our first class, after running through a song, Jason gave me a note about my left hand tension slightly bending my chords out of tune. It blew my mind that he was able to isolate what my fretting hand was doing amidst a flurry of guitars, drums, bass, and vocals. It was this kind of attention to detail that made Jason a valuable teacher. He understands the nuances of different genres and guitar styles, and he's able to break it down in a way that is easy to understand." — Thu T.
"Whether we are talking about styles, theory, or history, Jason has a full understanding of music. He can explain concepts or present lessons in a simple and succinct way. When I went to him for ideas on how to organize or structure a guitar solo, he listened… and then suggested arpeggios. My guitar playing and my knowledge of music grew exponentially. Thanks Jason!" — Carlos P.
Jason has taught and encouraged Allise and Erin to play the guitar. They have learned a tremendous amount about both reading music and playing. Jason has made it challenging and fun. He is calm and patient. In spite of some difficult practice material, the girls have never said they didn’t want to play or wanted to quit playing. This says a lot about their teacher. It is without reservation I can speak highly and endorse the musical education my daughters are receiving from Jason Myers. — Neal M.
Jason has been our son Mateo's guitar teacher for over 5 years. We have found him to be an excellent teacher, reliable and responsible in terms of communicating with us, and an important person in our son's life. Jason has always been encouraging and supportive, as well as a strong guide, helping Mateo enjoy the fruits of his talent and hard work. Jason always volunteers his time for group ensemble work for performances and has promoted Mateo having solo recitals as well. We couldn't be happier with our experience with Jason. — Yana S.
Jason has been teaching my son guitar for over 2 years and as a parent I have been very pleased. He gives me good feedback on what my son Cameron is doing and what he needs to work on. Personally I find Jason interesting, knowledgeable, honest and caring. Cameron's words about Jason are the following: He learns a lot of stuff, very helpful, challenges him, very fun to play in the ensemble, nice and discuss things in common. Jason is one of the reasons Cameron has not given up guitar and enjoys playing. 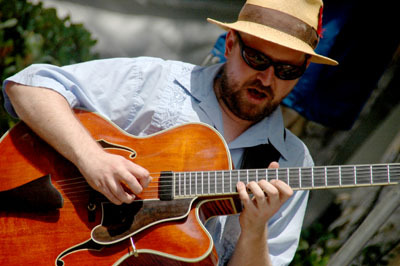 — Diane E.
For the last two and a half years, my 11 year-old son Aidan has taken guitar lessons from Jason Myers. Though he came into the lessons with a rough knowledge of chords and scales and such, through his time with Jason he has up his musicality and learned to read music. Jason’s emphasis on a regular practice schedule and a disciplined approach to the instrument have resonated with Aidan. Aidan holes up in his room several nights a week, preparing for his upcoming lesson. I think the guitar ensembles that Jason prepares for concerts and other community events (Aidan still brags to his friends about how he got to play an event at the Nokia Plaza) are most indicative of his commitment to his students. When players ranging in age from adults, to teenagers that I work with at Marshall High, down to players Aidan’s age and younger are given an opportunity to rehearse and perform music that has been scored and arranged (usually by Jason) to match their abilities, the result is a high point of the program it is performed in. I respect Jason but my son adores him. My middle son, Connor, recently began lessons with him. I look forward, not too many years in the future, to my youngest beginning guitar instruction with him. — Michael F.
Jason is a great teacher. His knowledge of guitar styles and technics enables him to help students with whatever they'd like to learn. I can't recommend him highly enough. Non-judgemental, fun, effective lessons. Jason is the best teacher I've ever had. 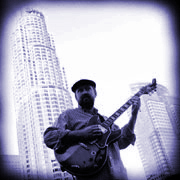 — Nate D.
Jason is a fantastic guitar teacher. He skillfully guides me through my own material while always challenging me to expand my musical vocabulary, and always with a great spirit and vitality. I am very fortunate to work with such a talented instructor. — Brian M.
As good as they come. Period. Jason is as good as they come. Period. If you want to get serious about learning the guitar, then give him a ring. His knowledgable yet casual approach to teaching will have you advancing in no time! — Brandi E.
As an adult this was not only my first guitar lesson but it was also my first music lesson. Jason made learning classical guitar so easy for me that I look back and wonder how he did it. I'm so happy to be able to have music in my life. No matter how my practice sessions go I always feel calm and peaceful afterward. Jason helped me to progress farther than I thought I would with the guitar in the 3 years of our lessons. Thank you so much Jason! I wish you all the best. — Kelly K.
Jason Myers is an excellent teacher that I would recommend to anyone who wants to expand their knowledge of the guitar or ukulele regardless of their current skill level. He is a patient teacher, encouraging, and challenging. He is sensitive to his students' needs and interests. In addition to his own mastery of the instruments, he has a vast knowledge of varying musical styles. Before I studied with Jason I had a very limited understanding of the guitar. He worked with me to improve my sight-reading ability, my improvisational skills and my understanding of the entire instrument. He introduced me to guitar players and musical styles that were previously unknown to me. Jason's instruction was a turning point for me as a musician, providing me with the skills and confidence necessary to pursue a career as a performer and recording artist. — Abby D.
Jason broadened my horizons as a musician. He taught me Music Theory and how to apply it to the guitar. I learned how to express myself on my instrument through improvisation. I also learned how to read music. I went from playing a couple box pattern scales on my guitar to learning how to use the whole fretboard. Everything he taught me has served me to this day. If you want to take guitar seriously and step up your playing, Jason is the man to show you the ropes. He is very passionate about music and loves to teach. If you set a goal, he will guide you and show you every step you need to take to achieve it. He is also a very talented musician and inspires those around him. Learn how to become more than just an average guitar player who can play a couple chords. Once you learn from him you will never be the same again. — Anthony S.
Working with Jason has been a tremendously rewarding experience. Jason listened well to what I wanted to get out of lessons and tailored our lessons to fit my needs as a musician. His attitude is always positive, encouraging, and jovial, and I always felt he was going the extra mile. His knowledge of the guitar, and of music in general, is truly massive, and he has taken a lot of time and energy to translate that knowledge into clear and concise teaching materials. When you study with Jason, you'll not only learn guitar, but how music is put together on a theoretical level. I highly recommend him. — Gregory N.